Large-scale mutations involve the deletion or gain of a portion of a chromosome. Genomic amplification occurs when a cell gains many copies (often 20 or more) of a small chromosomal region, usually containing one or more oncogenes and adjacent genetic material. Translocation occurs when two separate chromosomal regions become abnormally fused, often at a characteristic location. A well-known example of this is thePhiladelphia chromosome, or translocation of chromosomes 9 and 22, which occurs in chronic myelogenous leukemia, and results in production of the BCR-abl fusion protein, an oncogenic tyrosine kinase. Small-scale mutations include point mutations, deletions, and insertions, which may occur in the promoter of a gene and affect its expression, or may occur in the gene's coding sequence and alter the function or stability of itsprotein product. Disruption of a single gene may also result from integration of genomic material from a DNA virus or retrovirus, and such an event may also result in the expression of viral oncogenes in the affected cell and its descendants. The cells in which all these DNA alterations accumulate are difficult to trace, but two recent lines of evidence suggest that normal stem cells may be the cells of origin in cancer. First, there exists a highly positive correlation (Spearman’s rho = 0.81; P < 3.5 × 10−8) between the risk of developing cancer in a tissue and the number of normal stem cell divisions taking place in that same tissue. The correlation applied to 31 cancer types and extended across five orders of magnitude. This correlation means that if the normal stem cells from a tissue divide once, the cancer risk in that tissue is approximately 1X. If they divide 1,000 times, the cancer risk is 1,000X. And if the normal stem cells from a tissue divide 100,000 times, the cancer risk in that tissue is approximately 100,000X. This strongly suggests that the main reason we have cancer is that our normal stem cells divide, which implies that cancer originates in normal stem cells. Second, statistics show that most human cancers are diagnosed in aged people. This means that most cancers occur because our cells accumulate damage as we age. DNA is the only cellular component that can accumulate damage during our whole life, and stem cells are the only cells that can transmit our DNA from the zygote to the cells we have when we die. The rest of the cells cannot keep our DNA from the beginning of life until a possible cancer occurs. This implies that most cancers arise from normal stem cells. In further examples [tabulated in Cancer epigenetics]], epigenetic defects in cancers were found at frequencies of between 13%-100% for the DNA repair genes BRCA1, WRN, FANCB, FANCF, MGMT, MLH1, MSH2, MSH4, ERCC1, XPF, NEIL1 and ATMin cancers including those in breast, ovarian, colorectal, and the head and neck areas. In particular, two or more epigenetic deficiencies in expression of ERCC1, XPF and/or PMS2 were shown to occur simultaneously in the majority of the 49 colon cancers evaluated by Facista et al. When expression of DNA repair genes is reduced, this causes a DNA repair deficiency. This is shown in the figure at the 4th level from the top. With a DNA repair deficiency, more DNA damages remain in cells at a higher than usual level (5th level from the top in figure), and these excess damages cause increased frequencies of mutation and/or epimutation (6th level from top of figure). Experimentally, mutation rates increase substantially in cells defective inDNA mismatch repair or in Homologous recombinational repair (HRR). Chromosomal rearrangements and aneuploidy also increase in HRR defective cells During repair of DNA double strand breaks, or repair of other DNA damages, incompletely cleared sites of repair can cause epigenetic gene silencing. Field defects have been identified in association with cancers and are important in progression to cancer. However, it was pointed out by Rubin that "the vast majority of studies in cancer research has been done on well-defined tumors in vivo, or on discrete neoplastic foci in vitro. Yet there is evidence that more than 80% of the somatic mutations found in mutator phenotype human colorectal tumors occur before the onset of terminal clonal expansion… " Similarly, Vogelstein et al. also indicated that more than half of somatic mutations identified in tumors occurred in a pre-neoplastic phase (in a field defect), during growth of apparently normal cells. It would also be expected that many of the epigenetic alterations present in tumors may have occurred in pre-neoplastic field defects. Cancers are known to exhibit genome instability or a mutator phenotype. The protein-coding DNA within the nucleus is about 1.5% of the total genomic DNA. Within this protein-coding DNA (called the exome), an average cancer of the breast or colon can have about 60 to 70 protein altering mutations, of which about 3 or 4 may be "driver" mutations, and the remaining ones may be "passenger" mutations. However, the average number of DNA sequence mutations in the entire genome (including non-protein-coding regions) within a breast cancer tissue sample is about 20,000. In an average melanoma tissue sample (where melanomas have a higher exome mutation frequency) the total number of DNA sequence mutations is about 80,000. These high frequencies of mutations in the total nucleotide sequences within cancers suggest that often an early alteration in the field defect giving rise to a cancer (e.g. yellow area in the diagram in the preceding section) is a deficiency in DNA repair. The large field defects surrounding colon cancers (extending to about 10 cm on each side of a cancer) were shown by Facista et al. to frequently have epigenetic defects in 2 or 3 DNA repair proteins (ERCC1, XPF and/or PMS2) in the entire area of the field defect. When expression of DNA repair genes is reduced, DNA damages accumulate in cells at a higher than normal level, and these excess damages cause increased frequencies of mutation and/or epimutation. Mutation rates strongly increase in cells defective in DNA mismatch repair or in homologous recombinational repair (HRR). A deficiency in DNA repair, itself, can allow DNA damages to accumulate, and error-prone translesion synthesis past some of those damages may give rise to mutations. In addition, faulty repair of these accumulated DNA damages may give rise to epimutations. These new mutations and/or epimutations may provide a proliferative advantage, generating a field defect. Although the mutations/epimutations in DNA repair genes do not, themselves, confer a selective advantage, they may be carried along as passengers in cells when the cell acquires an additional mutation/epimutation that does provide a proliferative advantage. Most changes in cellular metabolism that allow cells to grow in a disorderly fashion lead to cell death. However once cancer begins, cancer cells undergo a process of natural selection: the few cells with new genetic changes that enhance their survival or reproduction continue to multiply, and soon come to dominate the growing tumor, as cells with less favorable genetic change are out-competed. This is exactly how pathogens such as MRSA can becomeantibiotic-resistant (or how HIV can become drug-resistant), and the same reason why crop blights and pests can become pesticide-resistant. This evolution is why cancer recurrences will have cells that have acquired cancer-drug resistance (or in some cases, resistance to radiation from radiotherapy). These biological changes are classical in carcinomas; other malignant tumors may not need to achieve them all. For example, tissue invasion and displacement to distant sites are normal properties ofleukocytes; these steps are not needed in the development of leukemia. The different steps do not necessarily represent individual mutations. For example, inactivation of a single gene, coding for the p53 protein, will cause genomic instability, evasion of apoptosis and increased angiogenesis. Not all the cancer cells are dividing. Rather, a subset of the cells in a tumor, called cancer stem cells, replicate themselves and generate differentiated cells. Oncogenes promote cell growth through a variety of ways. Many can produce hormones, a "chemical messenger" between cells that encourage mitosis, the effect of which depends on the signal transduction of the receiving tissue or cells. 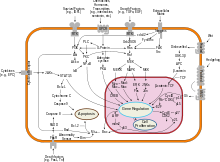 In other words, when a hormone receptor on a recipient cell is stimulated, the signal is conducted from the surface of the cell to the cell nucleus to affect some change in gene transcription regulation at the nuclear level. Some oncogenes are part of the signal transduction system itself, or the signal receptors in cells and tissues themselves, thus controlling the sensitivity to such hormones. Oncogenes often produce mitogens, or are involved intranscription of DNA in protein synthesis, which creates the proteins and enzymes responsible for producing the products and biochemicals cells use and interact with. One of the first oncogenes to be defined in cancer research is the ras oncogene. Mutations in the Ras family of proto-oncogenes (comprising H-Ras, N-Ras and K-Ras) are very common, being found in 20% to 30% of all human tumours.Ras was originally identified in the Harvey sarcoma virus genome, and researchers were surprised that not only is this gene present in the human genome but also, when ligated to a stimulating control element, it could induce cancers in cell line cultures. Proto-oncogenes promote cell growth in a variety of ways. Many can produce hormones, "chemical messengers" between cells that encourage mitosis, the effect of which depends on the signal transduction of the receiving tissue or cells. Some are responsible for the signal transduction system and signal receptors in cells and tissues themselves, thus controlling the sensitivity to such hormones. They often produce mitogens, or are involved in transcription of DNA inprotein synthesis, which create the proteins and enzymes is responsible for producing the products and biochemicals cells use and interact with. Tumor suppressor genes code for anti-proliferation signals and proteins that suppress mitosis and cell growth. Generally, tumor suppressors are transcription factors that are activated by cellularstress or DNA damage. Often DNA damage will cause the presence of free-floating genetic material as well as other signs, and will trigger enzymes and pathways that lead to the activation of tumor suppressor genes. The functions of such genes is to arrest the progression of the cell cycle in order to carry out DNA repair, preventing mutations from being passed on to daughter cells. 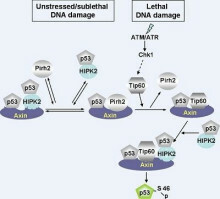 The p53protein, one of the most important studied tumor suppressor genes, is a transcription factor activated by many cellular stressors including hypoxia and ultraviolet radiation damage. Mutations of tumor suppressor genes that occur in germline cells are passed along to offspring, and increase the likelihood for cancer diagnoses in subsequent generations. Members of these families have increased incidence and decreased latency of multiple tumors. The tumor types are typical for each type of tumor suppressor gene mutation, with some mutations causing particular cancers, and other mutations causing others. The mode of inheritance of mutant tumor suppressors is that an affected member inherits a defective copy from one parent, and a normal copy from the other. For instance, individuals who inherit one mutant p53 allele (and are therefore heterozygous for mutated p53) can develop melanomas and pancreatic cancer, known as Li-Fraumeni syndrome. Other inherited tumor suppressor gene syndromes include Rb mutations, linked toretinoblastoma, and APC gene mutations, linked to adenopolyposis colon cancer. Adenopolyposis colon cancer is associated with thousands of polyps in colon while young, leading to colon cancer at a relatively early age. Finally, inherited mutations in BRCA1 and BRCA2 lead to early onset of breast cancer. When the damage occurs in any area of changed cells, something different occurs. Each of the cells has the potential for growth. The changed cells will divide quicker when the area is damaged by physical, chemical, or viral agents. Avicious circle has been set up: Damaging the area will cause the changed cells to divide, causing a greater likelihood that they will suffer knock-outs. There is such point of view that mechanical factors can cause carcinogenesis. Jump up^ Fearon ER, Vogelstein B (June 1990). "A genetic model for colorectal tumorigenesis". Cell 61 (5): 759–67.doi:10.1016/0092-8674(90)90186-I. PMID 2188735. ^ Jump up to:a b Wood LD, Parsons DW, Jones S, Lin J, Sjöblom T, Leary RJ, Shen D, Boca SM, Barber T, Ptak J, Silliman N, Szabo S, Dezso Z, Ustyanksky V, Nikolskaya T, Nikolsky Y, Karchin R, Wilson PA, Kaminker JS, Zhang Z, Croshaw R, Willis J, Dawson D, Shipitsin M, Willson JK, Sukumar S, Polyak K, Park BH, Pethiyagoda CL, Pant PV, Ballinger DG, Sparks AB, Hartigan J, Smith DR, Suh E, Papadopoulos N, Buckhaults P, Markowitz SD, Parmigiani G, Kinzler KW, Velculescu VE, Vogelstein B.; Parsons; Jones; Lin; Sjöblom; Leary; Shen; Boca; Barber; Ptak; Silliman; Szabo; Dezso; Ustyanksky; Nikolskaya; Nikolsky; Karchin; Wilson; Kaminker; Zhang; Croshaw; Willis; Dawson; Shipitsin; Willson; Sukumar; Polyak; Park; Pethiyagoda; Pant (2007). "The genomic landscapes of human breast and colorectal cancers". Science 318 (5853): 1108–1113. doi:10.1126/science.1145720.PMID 17932254. Jump up^ Croce CM (January 2008). "Oncogenes and cancer". The New England Journal of Medicine 358 (5): 502–11.doi:10.1056/NEJMra072367. PMID 18234754. Jump up^ Lim, LP; Lau, NC; Garrett-Engele, P; Grimson, A; Schelter, JM; Castle, J; Bartel, DP; Linsley, PS; Johnson, JM (2005). "Microarray analysis shows that some microRNAs downregulate large numbers of target mRNAs". Nature433 (7027): 769–773. doi:10.1038/nature03315. PMID 15685193. ^ Jump up to:a b Balaguer, F.; Link, A.; Lozano, J. J.; Cuatrecasas, M.; Nagasaka, T.; Boland, C. R.; Goel, A. (2010). "Epigenetic Silencing of miR-137 is an Early Event in Colorectal Carcinogenesis". Cancer Research 70 (16): 6609–6618. doi:10.1158/0008-5472.CAN-10-0622. PMC 2922409. PMID 20682795. ^ Jump up to:a b Knudson AG (November 2001). "Two genetic hits (more or less) to cancer". Nature Reviews Cancer 1 (2): 157–62. doi:10.1038/35101031. PMID 11905807. Jump up^ Daniel, Filipe Ivan; Cherubini, Karen; Yurgel, Liliane Soares; De Figueiredo, Maria Antonia Zancanaro; Salum, Fernanda Gonçalves (2011). "The role of epigenetic transcription repression and DNA methyltransferases in cancer". Cancer 117 (4): 677–687. doi:10.1002/cncr.25482. PMID 20945317. Review. Jump up^ Kanwal, R; Gupta, S (2012). "Epigenetic modifications in cancer". Clinical Genetics 81 (4): 303–311.doi:10.1111/j.1399-0004.2011.01809.x. PMC 3590802. PMID 22082348. Jump up^ Pattani, Kavita M.; Soudry, Ethan; Glazer, Chad A.; Ochs, Michael F.; Wang, Hao; Schussel, Juliana; Sun, Wenyue; Hennessey, Patrick; Mydlarz, Wojciech; Loyo, Myriam; Demokan, Semra; Smith, Ian M.; Califano, Joseph A. (2012). Tao, Qian, ed. "MAGEB2 is Activated by Promoter Demethylation in Head and Neck Squamous Cell Carcinoma". PLoS ONE 7 (9): e45534. doi:10.1371/journal.pone.0045534. PMC 3454438. PMID 23029077. Jump up^ Sampath, D.; Liu, C.; Vasan, K.; Sulda, M.; Puduvalli, V. K.; Wierda, W. G.; Keating, M. J. (2011). "Histone deacetylases mediate the silencing of miR-15a, miR-16, and miR-29b in chronic lymphocytic leukemia". Blood119 (5): 1162–1172. doi:10.1182/blood-2011-05-351510. PMC 3277352. PMID 22096249. Jump up^ Hitchler, Michael J.; Oberley, Larry W.; Domann, Frederick E. (2008). "Epigenetic silencing of SOD2 by histone modifications in human breast cancer cells". Free Radical Biology and Medicine 45 (11): 1573–1580.doi:10.1016/j.freeradbiomed.2008.09.005. PMC 2633123. PMID 18845242. Jump up^ Baldassarre, G; Battista, S; Belletti, B; Thakur, S; Pentimalli, F; Trapasso, F; Fedele, M; Pierantoni, G; Croce, CM; Fusco, A (2003). "Negative regulation of BRCA1 gene expression by HMGA1 proteins accounts for the reduced BRCA1 protein levels in sporadic breast carcinoma". Molecular and Cellular Biology 23 (7): 2225–2238. doi:10.1128/MCB.23.7.2225-2238.2003. PMC 150734. PMID 12640109. ^ Jump up to:a b Lopez-Lazaro M (August 2015). "Stem cell division theory of cancer". Cell Cycle 14 (16): 1–2.doi:10.1080/15384101.2015.1062330. PMID 26090957. ^ Jump up to:a b c Lopez-Lazaro M (May 2015). "The migration ability of stem cells can explain the existence of cancer of unknown primary site. Rethinking metastasis.". Oncoscience 2 (5): 467–75. PMID 26097879. Jump up^ Tomasetti C, Vogelstein B (January 2015). "Cancer etiology. Variation in cancer risk among tissues can be explained by the number of stem cell divisions.". Science 347 (6217): 78–81. doi:10.1126/science.1260825.PMID 25554788. Jump up^ "DNA Damage and Cancer". Scitopics.com. 2009-01-14. Retrieved 7 January 2014. ^ Jump up to:a b Cunningham, F.H. ; Fiebelkorn, S.; Johnson, M.; Meredith, C. (2011). "A novel application of the Margin of Exposure approach: Segregation of tobacco smoke toxicants". Food and Chemical Toxicology 49 (11): 2921–2933. doi:10.1016/j.fct.2011.07.019. PMID 21802474. Jump up^ Kanavy, Holly E.; Gerstenblith, Meg R. (2011). "Ultraviolet Radiation and Melanoma". Seminars in Cutaneous Medicine and Surgery 30 (4): 222–228. doi:10.1016/j.sder.2011.08.003. PMID 22123420. Jump up^ Handa, Osamu; Naito, Yuji; Yoshikawa, Toshikazu (2011). "Redox biology and gastric carcinogenesis: The role of Helicobacter pylori". Redox Report 16 (1): 1–7. doi:10.1179/174329211X12968219310756. PMID 21605492. Jump up^ Smela, ME; Hamm, ML; Henderson, PT; Harris, CM; Harris, TM; Essigmann, JM (2002). "The aflatoxin B(1) formamidopyrimidine adduct plays a major role in causing the types of mutations observed in human hepatocellular carcinoma". Proceedings of the National Academy of Sciences of the United States of America99 (10): 6655–60. doi:10.1073/pnas.102167699. PMC 124458. PMID 12011430. Jump up^ Katsurano, M; Niwa, T; Yasui, Y; Shigematsu, Y; Yamashita, S; Takeshima, H; Lee, M S; Kim, Y-J; Tanaka, T; Ushijima, T (2011). "Early-stage formation of an epigenetic field defect in a mouse colitis model, and non-essential roles of T- and B-cells in DNA methylation induction". Oncogene 31 (3): 342–351.doi:10.1038/onc.2011.241. PMID 21685942. Jump up^ Bernstein, Carol; Holubec, Hana; Bhattacharyya, Achyut K.; Nguyen, Huy; Payne, Claire M.; Zaitlin, Beryl; Bernstein, Harris (2011). "Carcinogenicity of deoxycholate, a secondary bile acid". Archives of Toxicology85 (8): 863–71. doi:10.1007/s00204-011-0648-7. PMC 3149672. PMID 21267546. Jump up^ Malkin, D. (2011). "Li-Fraumeni Syndrome". Genes & Cancer 2 (4): 475–484. doi:10.1177/1947601911413466.PMC 3135649. PMID 21779515. Jump up^ Fearon, ER (1997). "Human cancer syndromes: Clues to the origin and nature of cancer". Science 278 (5340): 1043–1050. doi:10.1126/science.278.5340.1043. PMID 9353177. Jump up^ Lichtenstein, Paul; Holm, Niels V.; Verkasalo, Pia K.; Iliadou, Anastasia; Kaprio, Jaakko; Koskenvuo, Markku; Pukkala, Eero; Skytthe, Axel; Hemminki, Kari (2000). "Environmental and Heritable Factors in the Causation of Cancer — Analyses of Cohorts of Twins from Sweden, Denmark, and Finland". New England Journal of Medicine 343 (2): 78–85. doi:10.1056/NEJM200007133430201. PMID 10891514. Jump up^ Halford, S; Rowan, A; Sawyer, E; Talbot, I; Tomlinson, I (2005). "O6-methylguanine methyltransferase in colorectal cancers: Detection of mutations, loss of expression, and weak association with G:C>A:T transitions". Gut 54 (6): 797–802. doi:10.1136/gut.2004.059535. PMC 1774551. PMID 15888787. Jump up^ Shen, L.; Kondo, Y.; Rosner, G. L.; Xiao, L.; Hernandez, N. S.; Vilaythong, J.; Houlihan, P. S.; Krouse, R. S.; Prasad, A. R.; Einspahr, J. G.; Buckmeier, J.; Alberts, D. S.; Hamilton, S. R.; Issa, J.-P. J. (2005). "MGMT Promoter Methylation and Field Defect in Sporadic Colorectal Cancer". JNCI Journal of the National Cancer Institute 97 (18): 1330–1338. doi:10.1093/jnci/dji275. PMID 16174854. Jump up^ Psofaki, Vasiliki; Kalogera, C; Tzambouras, N; Stephanou, D; Tsianos, E; Seferiadis, K; Kolios, G (2010). "Promoter methylation status ofhMLH1,MGMT, andCDKN2A/p16in colorectal adenomas". World Journal of Gastroenterology 16 (28): 3553–3560. doi:10.3748/wjg.v16.i28.3553. PMC 2909555. PMID 20653064. ^ Jump up to:a b Lee, Kyung-Hwa; Lee, Ji-Shin; Nam, Jong-Hee; Choi, Chan; Lee, Min-Cheol; Park, Chang-Soo; Juhng, Sang-Woo; Lee, Jae-Hyuk (2011). "Promoter methylation status of hMLH1, hMSH2, and MGMT genes in colorectal cancer associated with adenoma–carcinoma sequence". Langenbeck's Archives of Surgery 396 (7): 1017–1026.doi:10.1007/s00423-011-0812-9. PMID 21706233. Jump up^ Amatu, A.; Sartore-Bianchi, A.; Moutinho, C.; Belotti, A.; Bencardino, K.; Chirico, G.; Cassingena, A.; Rusconi, F.; Esposito, A.; Nichelatti, M.; Esteller, M.; Siena, S. (2013). "Promoter CpG Island Hypermethylation of the DNA Repair Enzyme MGMT Predicts Clinical Response to Dacarbazine in a Phase II Study for Metastatic Colorectal Cancer". Clinical Cancer Research 19 (8): 2265–72. doi:10.1158/1078-0432.CCR-12-3518. PMID 23422094. Jump up^ Mokarram, P.; Zamani, M.; Kavousipour, S.; Naghibalhossaini, F.; Irajie, C.; Moradi Sarabi, M.; Hosseini, S. V. (2012). "Different patterns of DNA methylation of the two distinct O6-methylguanine-DNA methyltransferase (O6-MGMT) promoter regions in colorectal cancer". Molecular Biology Reports 40 (5): 3851–7.doi:10.1007/s11033-012-2465-3. PMID 23271133. Jump up^ Truninger, Kaspar; Menigatti, Mirco; Luz, Judith; Russell, Anna; Haider, Ritva; Gebbers, Jan-Olaf; Bannwart, Fridolin; Yurtsever, Hueseyin; Neuweiler, Joerg; Riehle, Hans-Martin; Cattaruzza, Maria Sofia; Heinimann, Karl; Schär, Primo; Jiricny, Josef; Marra, Giancarlo (2005). "Immunohistochemical Analysis Reveals High Frequency of PMS2 Defects in Colorectal Cancer". Gastroenterology 128 (5): 1160–1171.doi:10.1053/j.gastro.2005.01.056. PMID 15887099. Jump up^ Valeri, N.; Gasparini, P.; Fabbri, M.; Braconi, C.; Veronese, A.; Lovat, F.; Adair, B.; Vannini, I.; Fanini, F.; Bottoni, A.; Costinean, S.; Sandhu, S. K.; Nuovo, G. J.; Alder, H.; Gafa, R.; Calore, F.; Ferracin, M.; Lanza, G.; Volinia, S.; Negrini, M.; McIlhatton, M. A.; Amadori, D.; Fishel, R.; Croce, C. M. (2010). "Modulation of mismatch repair and genomic stability by miR-155". Proceedings of the National Academy of Sciences 107 (15): 6982–6987. doi:10.1073/pnas.1002472107. PMC 2872463. PMID 20351277. ^ Jump up to:a b c Facista, Alexander; Nguyen, Huy; Lewis, Cristy; Prasad, Anil R; Ramsey, Lois; Zaitlin, Beryl; Nfonsam, Valentine; Krouse, Robert S; Bernstein, Harris; Payne, Claire M; Stern, Stephen; Oatman, Nicole; Banerjee, Bhaskar; Bernstein, Carol (2012). "Deficient expression of DNA repair enzymes in early progression to sporadic colon cancer". Genome Integrity 3 (1): 3. doi:10.1186/2041-9414-3-3. PMC 3351028. PMID 22494821. ^ Jump up to:a b Narayanan, L.; Fritzell, J. A.; Baker, S. M.; Liskay, R. M.; Glazer, P. M. (1997). "Elevated levels of mutation in multiple tissues of mice deficient in the DNA mismatch repair gene Pms2". Proceedings of the National Academy of Sciences 94 (7): 3122–3127. doi:10.1073/pnas.94.7.3122. PMC 20332. PMID 9096356. ^ Jump up to:a b Hegan, D. C.; Narayanan, L.; Jirik, F. R.; Edelmann, W.; Liskay, R.M. ; Glazer, P. M. (2006). "Differing patterns of genetic instability in mice deficient in the mismatch repair genes Pms2, Mlh1, Msh2, Msh3 and Msh6". Carcinogenesis 27 (12): 2402–2408. doi:10.1093/carcin/bgl079. PMC 2612936. PMID 16728433. ^ Jump up to:a b Tutt, A. N.J.; Van Oostrom, CT; Ross, GM; Van Steeg, H; Ashworth, A (2002). "Disruption of Brca2 increases the spontaneous mutation rate in vivo: Synergism with ionizing radiation". EMBO Reports 3 (3): 255–260. doi:10.1093/embo-reports/kvf037. PMC 1084010. PMID 11850397. Jump up^ German, J (1969). "Bloom's syndrome. I. Genetical and clinical observations in the first twenty-seven patients". American Journal of Human Genetics 21 (2): 196–227. PMC 1706430. PMID 5770175. Jump up^ O'Hagan, Heather M.; Mohammad, Helai P.; Baylin, Stephen B. (2008). Lee, Jeannie T, ed. "Double Strand Breaks Can Initiate Gene Silencing and SIRT1-Dependent Onset of DNA Methylation in an Exogenous Promoter CpG Island". PLoS Genetics 4 (8): e1000155. doi:10.1371/journal.pgen.1000155. PMC 2491723. PMID 18704159. Jump up^ Cuozzo, Concetta; Porcellini, Antonio; Angrisano, Tiziana; Morano, Annalisa; Lee, Bongyong; Di Pardo, Alba Di; Messina, Samantha; Iuliano, Rodolfo; Fusco, Alfredo; Santillo, Maria R.; Muller, Mark T.; Chiariotti, Lorenzo; Gottesman, Max E.; Avvedimento, Enrico V. (2007). "DNA Damage, Homology-Directed Repair, and DNA Methylation". PLoS Genetics 3 (7): e110. doi:10.1371/journal.pgen.0030110. PMC 1913100. PMID 17616978. Jump up^ Roy, M; Sinha, D; Mukherjee, S; Biswas, J (2011). "Curcumin prevents DNA damage and enhances the repair potential in a chronically arsenic-exposed human population in West Bengal, India". European journal of cancer prevention : the official journal of the European Cancer Prevention Organisation (ECP) 20 (2): 123–131.doi:10.1097/CEJ.0b013e328341017a. PMID 21332098. Jump up^ Qin, XJ; Liu, W; Li, YN; Sun, X; Hai, CX; Hudson, LG; Liu, KJ (2012). "Poly(ADP-ribose) polymerase-1 inhibition by arsenite promotes the survival of cells with unrepaired DNA lesions induced by UV exposure".Toxicological sciences : an official journal of the Society of Toxicology 127 (1): 120–129.doi:10.1093/toxsci/kfs099. PMC 3327874. PMID 22387748. Jump up^ Ebert, F; Weiss, A; Bültemeyer, M; Hamann, I; Hartwig, A; Schwerdtle, T (2011). "Arsenicals affect base excision repair by several mechanisms". Mutation research 715 (1–2): 32–41.doi:10.1016/j.mrfmmm.2011.07.004. PMID 21782832. Jump up^ Andrew, AS; Karagas, MR; Hamilton, JW (2003). "Decreased DNA repair gene expression among individuals exposed to arsenic in United States drinking water". International Journal of Cancer. Journal International Du Cancer 104 (3): 263–268. doi:10.1002/ijc.10968. PMID 12569548. Jump up^ Nollen, M; Ebert, F; Moser, J; Mullenders, LH; Hartwig, A; Schwerdtle, T (2009). "Impact of arsenic on nucleotide excision repair: XPC function, protein level, and gene expression". Molecular nutrition & food research 53 (5): 572–582. doi:10.1002/mnfr.200800480. PMID 19382146. Jump up^ Shen, S; Lee, J; Weinfeld, M; Le, XC (2008). "Attenuation of DNA damage-induced p53 expression by arsenic: A possible mechanism for arsenic co-carcinogenesis". Molecular carcinogenesis 47 (7): 508–518.doi:10.1002/mc.20406. PMID 18085531. Jump up^ Zhou, ZH; Lei, YX; Wang, CX (2012). "Analysis of aberrant methylation in DNA repair genes during malignant transformation of human bronchial epithelial cells induced by cadmium". Toxicological sciences : an official journal of the Society of Toxicology 125 (2): 412–417. doi:10.1093/toxsci/kfr320. PMID 22112500. Jump up^ Wieland, M; Levin, MK; Hingorani, KS; Biro, FN; Hingorani, MM (2009). "Mechanism of cadmium-mediated inhibition of Msh2-Msh6 function in DNA mismatch repair". Biochemistry 48 (40): 9492–9502.doi:10.1021/bi9001248. PMID 19320425. Jump up^ Bravard, A; Vacher, M; Gouget, B; Coutant, A; De Boisferon, FH; Marsin, S; Chevillard, S; Radicella, JP (2006). "Redox regulation of human OGG1 activity in response to cellular oxidative stress". Molecular and Cellular Biology 26 (20): 7430–7436. doi:10.1128/MCB.00624-06. PMC 1636869. PMID 16923968.